Alongside Haitian food, Mexican food will have to be my next favorite food to eat. I remember when my husband surprised me with a trip to Mexico a couple of years ago. We stayed at Live Aqua Resort. The following days we traveled Riviera Maya and Tulum to learn a little more about Mexico and the culture. The food was pure, delicious, bold, vibrant, and authentic – of course. Definitely nothing like we have in the States. As wonderful the trip was, for some reason none of the foods we ate included corn. But in this delicious Tex-Mex side dish, you’ll have a taste of Mexican flavor right in your home. 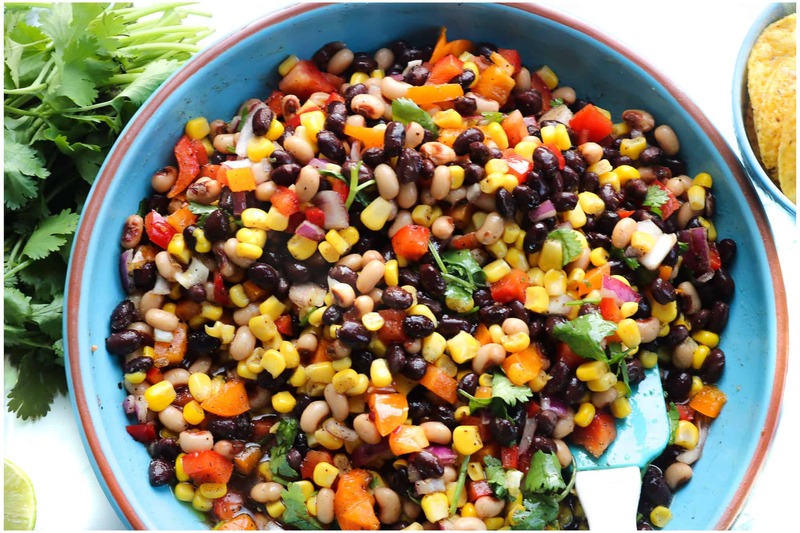 It also plays well with other Tex-Mex side dishes like my cowboy caviar. 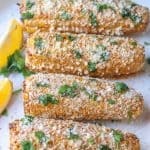 Why does this Air Fryer Mexican Street Corn Recipe (Elotes) work? If you have never had Mexican street corn, you are missing out. It is usually served on the cob, and often on a stick. I have had this corn grilled, boiled, and baked. And now I am introducing the air fryer version to you. Who doesn’t love a good corn on the cob? Especially one that’s slathered in pure goodness; sour cream, cotija cheese, and chili powder sauce! The corn is air fried to perfection. Great for entertaining and backyard parties. Great for gatherings and beach parties. It has the right amount of spice and the right amount of messiness to make you go after another one, without hesitation. Truly everyone’s favorite corn on the cob. 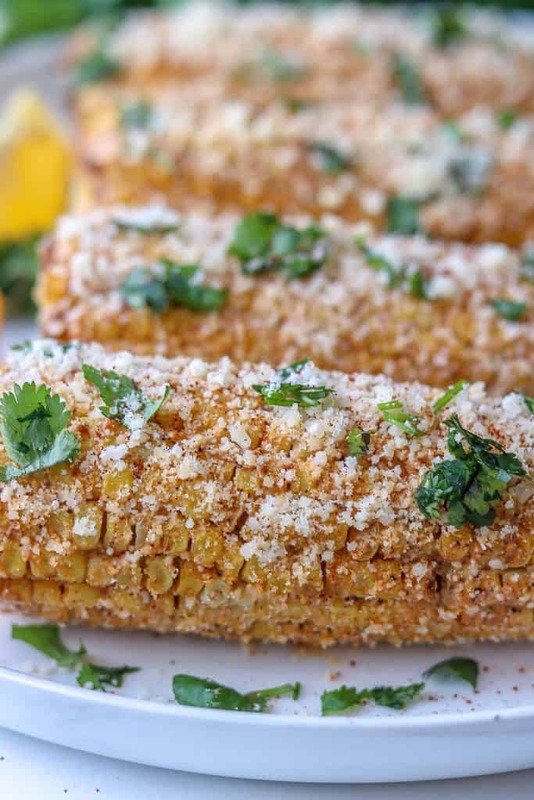 How To Make Mexican Street Corn? Gather the ingredients (Picture 1). Preheat the air fryer to 400 degrees. Melt the butter. Using a pastry brush, coat the corn on all sides. Reserve the remaining butter to prepare the sauce. Place the corn into the air fryer basket and cook for 10 minutes (Picture 2). Flip or turn to cook the corn evenly (Picture 3). Chop the cilantro and set aside. In a medium bowl, combine the salt and pepper, melted butter, chili powder, and sour cream (Picture 4). 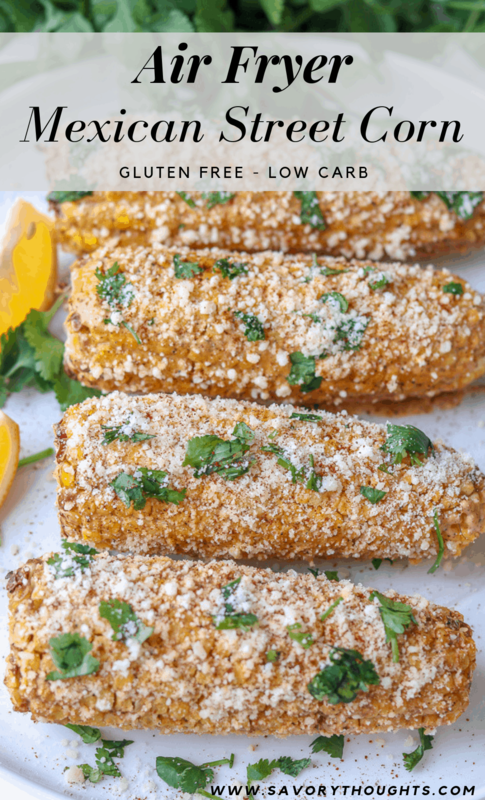 Did you make these Air Fryer Mexican Street Corn Recipe? Tag me on Instagram or Facebook and please give it a star rating below! 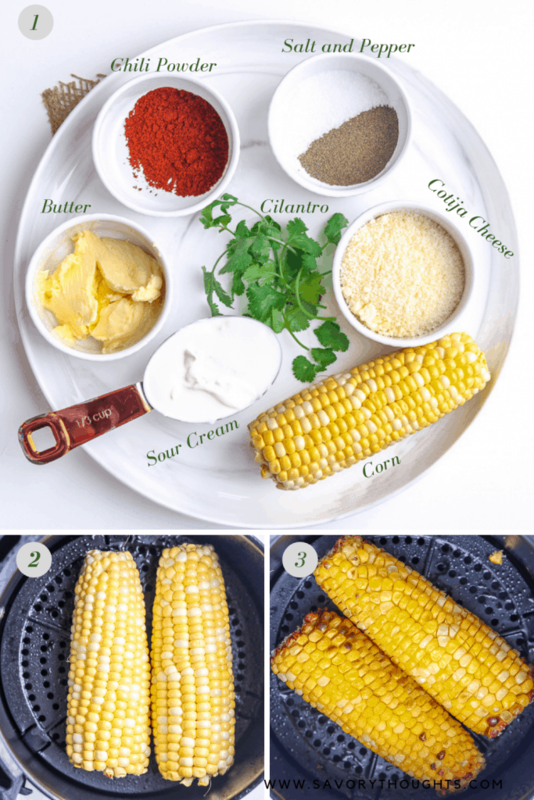 SAVE THIS AIR FRYER CORN RECIPE TO YOUR PINTEREST BOARDS! 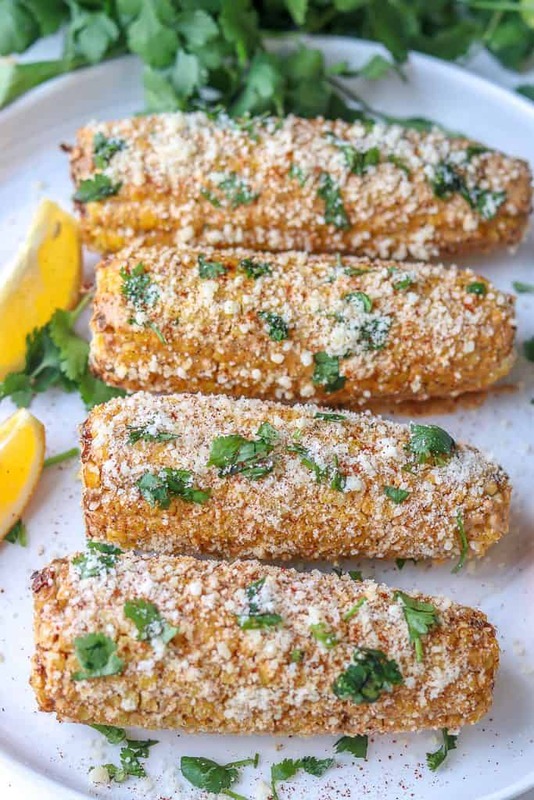 Easy Air Fryer Mexican Street Corn On The Cob that will draw everyone to the table. Air fried to perfection. It takes only 10 minutes. It is gluten-free and low carb! Preheat the air fryer to 400 degrees. Chop the cilantro and set aside. Melt the butter in a medium bowl. Using a pastry brush, coat the corn on all sides. Reserve the remaining butter to prepare the sauce. Place the corn into the air fryer basket and cook for 10 minutes. Flip or turn the corn to cook the corn evenly while cooking. In a medium bowl, combine the salt and pepper, melted butter, chili powder, and sour cream. Remove the corn from the air fryer and apply the sauce. Pour the cotija cheese in a large plate, apply the cotija cheese to the corn by either rolling the corn in the cheese or sprinkling the cheese over the corn. 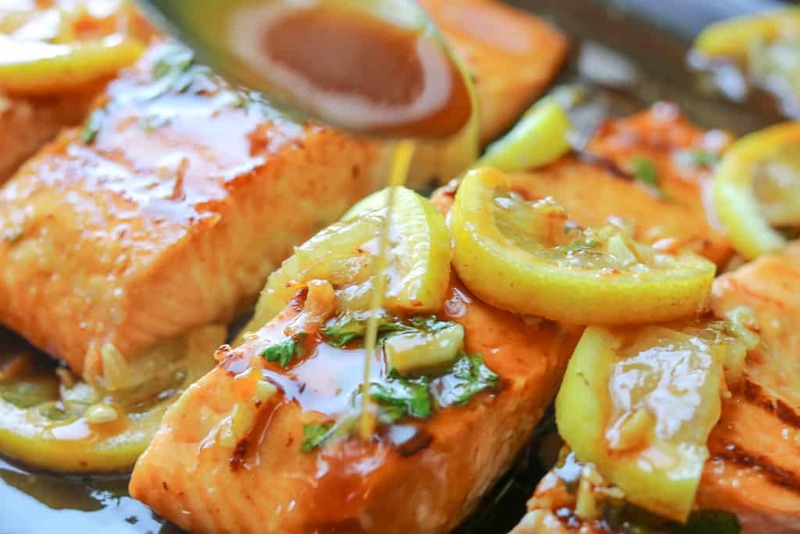 Finish it off by adding the cilantro and squeezing a little lemon juice for extra zest. Finally, ENJOY! You can use feta cheese if it is difficult to find Cotija cheese. I have even used parmesan cheese as well. YES, the corn is as crispy as if it was cooked on a grill. If you want your corn a bit more charred feel free to add a couple more minutes to the cooking time. Oh, I’m so in love with your Mexican street corn! I’m all about that cojita and chili powder. And then you cook it in an air fryer? So brilliant! What a great recipe. Yum! I love the seasoning mix you used on these. I especially love that they have a but of sour cream and cotija cheese. These are an awesome upgrade from traditional corn on the cob! Totally LOVE my air fryer. This corn looks amazing. I need to make so much more in this FUN kitchen appliance. The food turns out delicious all the time. The Air Fryer is simply the best, right?! Thanks, Gloria. 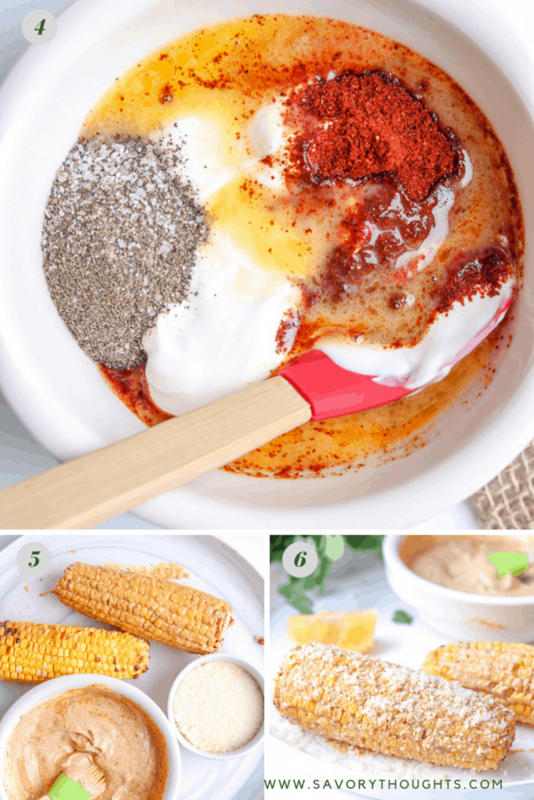 Ohh I love elotes, it’s such a delicious summer side dish! And using an air fryer is genius, I would love to try it. Thank you, Mari. I love my air fryer. Wow, wow, wow. I don’t have an air fryer but I am going to make this anyway.All those flavors are amazing. Mexican street corn is the best! seriously. It has so many wonderful flavors. using the air fryer to make it is genius! I almost passed by this recipe until I realized it said “air-fried” Mexican street corn. I mean I have had it grilled, boiled, and baked before as well I would love to try this in my new fryer! I am glad you decided to visit the site. Hope you enjoy the recipe. 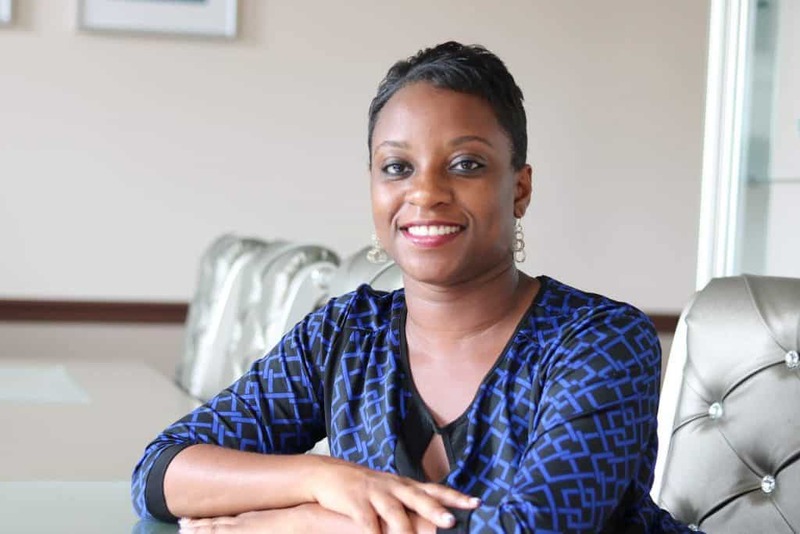 Am also a Haitian who love Mexican food. This corn on the cob recipe look delicious. I live in Sweden and we don’t have access to cojita cheese but we love feta so will try it with that. Thanks for the inspiration. I still don’t have an air fryer (on my wish list!) but when I get one this corn is definitely on my list of recipes to make with it! It looks wonderful! You will love it. Between my air fryer and Instant Pot or Power Cooker, I have yet to turn on the stove for months. Good, Karyl! I hope you enjoy it! This corn must be delicious with the cotija cheese on top. I love corn on knob but never tried this way. It looks so yummy. Elotes are sooo yummy! They are an absolute summer favorite at our house but we always grill them. Therefore, we never have them in fall, winter. Thanks for the air fryer idea! Now we can have them year-round! Wonderful. I am happy to hear that. Thank you, Jori. 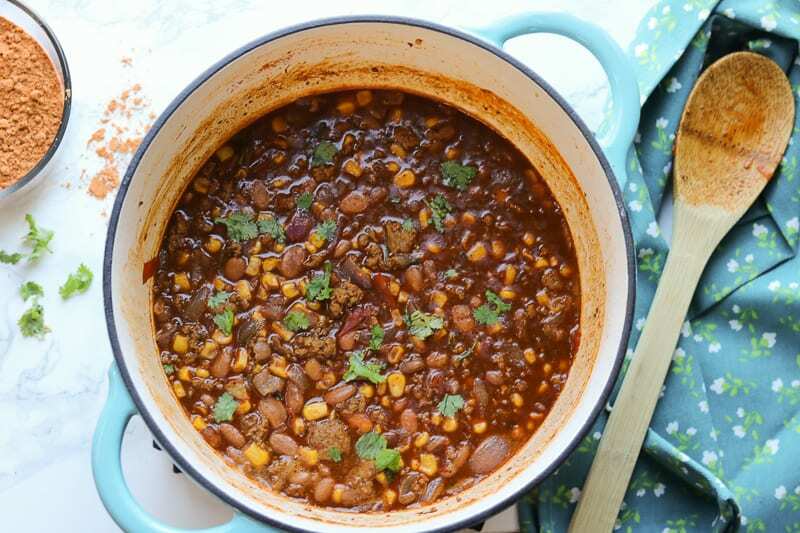 I can’t believe how quick this recipe is! 10 minutes only? That is exactly what I have been looking for. And the fact that it is GF and low carb just makes it perfect!